Macroprudential policies increasingly lie at the heart of how central banks jointly manage of price and financial stability. However, consensus over best practice has yet to emerge. This column presents an improved indicator to measure individual economies’ macroprudential policy capacity. Improvements include incorporating the shadow banking sector, and distinguishing the types of institutions that wield authority. Results suggest that improvements continue to be made with respect to the development of an international financial system with improved resilience to shocks. Since the Global Crisis of 2008-9, central banks and other agencies have taken on greater responsibilities to ensure “…through regulation, that the financial system can serve the real economy, in good times and bad” (Brazier 2017), a key component of which is macroprudential policy. Unfortunately, there is still no consensus on what constitutes best practice in developing macroprudential policy strategies, though considerable progress is indeed being made to reduce the likelihood of financial turmoil of the kind that erupted in 2007. This absence of a common understanding about what constitutes a macroprudential policy strategy is precisely what led us to propose a policy capacity indicator (Lombardi and Siklos 2016a, 2016b). Understandably, scepticism remains about whether macroprudential instruments can effectively ensure financial system stability. To paraphrase Ben Bernanke’s comment on the effectiveness of quantitative easing, macroprudential policy undoubtedly can work in theory but it is unclear how effective it is in practice. Our original research measures the capacity of policymakers and macroprudential frameworks in 46 economies to deal with risks to financial system stability. The resulting indicator is influenced by the size and quality of a given jurisdiction’s macroprudential policy toolkit, the contribution of relevant institutions (central bank, microprudential regulator, finance ministry, etc. ), and the cohesion of the governance structures tasked with pursuing the financial stability goal. The indicator combines de jure and de facto macroprudential policy practices, as well as a critical role for the central bank, consistent with an emerging consensus on their important part in pursuing the goal of financial stability (e.g. IMF-FSB-BIS 2016, Lombardi and Schembri 2016). Our (normalised) indicator has the virtue of being significantly correlated with credit growth, long considered a prime candidate as a leading indicator of financial instability (Lombardi and Siklos 2016a). Nevertheless, our original indicator can be improved in three important ways. First, it was only constructed for data up to 2015. Policymakers and outside observers want to assess progress in their ability to deal with financial stability risks over time. Therefore, we provide our first update to the capacity indicator for data until the end of 2016. Second, our original indicator did not discriminate according to which agency had authority over what instruments. In our latest work, we correct this deficiency thanks to the availability of new information that allows us to identify who can do what. Third, due to data recently made available, we are now able to quantify the contribution of shadow banking regulation in preserving financial stability. Indeed, a striking feature of the Global Crisis was just how quickly it propagated, owing largely to the development of a shadow banking system during the years of deregulation and rapid credit growth that preceded the financial crisis (e.g. Eichengreen 2008, Bordo 2008). Shadow banking systems, or the non-bank financial sector, as they are commonly referred to, were for the most part, both unregulated and outside the immediate purview of central banks’ oversight. In updating our original indicator of each country’s capacity to implement macroprudential policy and thus achieve financial stability, we have also expanded slightly the number of economies covered by the index.1 The revised index now captures two more countries/jurisdictions – Hong Kong and the Philippines – bringing the number of countries/jurisdictions for which we produce an index to 48. We find that Hong Kong scores well in its macroprudential policy capacity, which is no doubt a reflection of the important role played by the financial sector in its economy. 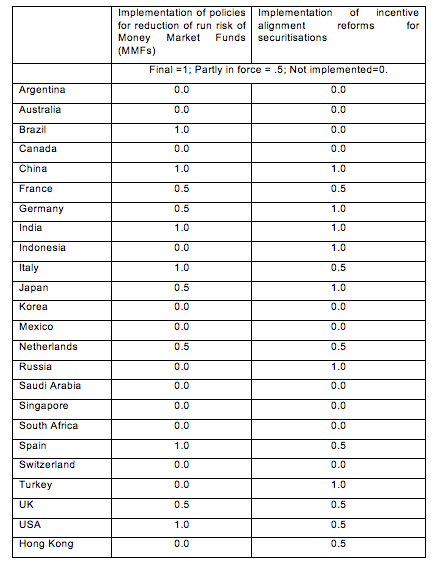 The Philippines, on the other hand, has an index score below those estimated for most Asia-Pacific economies (e.g. Thailand, Indonesia, and Malaysia) that also suffered from the 1997-98 Asian Financial Crisis. In general, the number of macroprudential policy instruments available to central banks and the relevant macroprudential authorities has increased. For EU economies, mandatory requirements under the Capital Requirements Directive and Regulation (CRD/CRR) to implement counter-cyclical capital buffer regimes by January 2016, are partly responsible for the increase in the number of instruments declared and/or deployed. Indeed, even countries outside the EU, such as Switzerland, Singapore, Russia, Korea, Iceland, and Australia, began applying counter-cyclical capital buffers in early 2016. In some cases, the additional macroprudential instruments identified in our updated version of the index were in fact deployed before 2015, however, due to insufficient information at the time, these instruments could not be incorporated into our original index. Source: Lombardi and Siklos (2016a) and authors’ update. Improvements in the capacity of a number of the economies covered by our index to deal with threats to financial system stability appear to bode well for the future resilience of the financial sector. However, the next crisis or major financial shocks will serve as an important test of how well existing instruments can be deployed, and how effective they can be. It may also require another major financial shock before there is renewed emphasis on international cooperation. After all, it took the Global Crisis to create the FSB as a means of promoting international financial regulation. Yet, at the moment, there is little indication that international collaborative efforts in the realm of financial stability are high on the list of priorities. In ongoing work, we are planning to distinguish between internal (e.g. loan-to-value ratio) versus external (e.g. capital controls) macroprudential instruments and policies. In addition, there is a difference between instruments that are intended to enhance the resilience of the financial sector (e.g. capital adequacy ratios) versus those that are meant to pre-empt future sources of instability (e.g. stress tests). Separating the two is another area where we plan to improve our existing indicator. Bordo, M (2008) “A historical perspective on the crisis of 2007-2008”, NBER, working paper 14569. Brazier, A (2017) “How to: MACROPRU—5 principles for macroprudential policy ”, speech given at the London School of Economics, 13 February. Eichengreen, B (2008) “Origins and responses to the crisis”, UC Berkeley, October, mimeo. International Monetary Fund (2016) Global financial stability report, October. IMF-FSB-BIS (2016), Elements of effective macroprudential policies: Lessons from international experience, August. Lombardi, D and P L Schembri (2016) “Reinventing the role of central banks in financial stability ”, Bank of Canada Review, Autumn: 1-11. Lombardi, D and P L Siklos (2016a) “Benchmarking macroprudential policies: An initial assessment ”, Journal of Financial Stability, 27: 35-49. Lombardi, D and P L Siklos (2016b) “Resiliency of macroprudential frameworks: An international comparison ”, Voxeu.org, 7 November. The index scores are derived from over 30 elements allocated to eight categories: (1) authority and mandate for deploying macroprudential policies; (2) number of entities responsible for maintenance of financial stability and their coordination; (3) existence of a deposit insurance scheme; (4) degree of transparency and accountability in the macroprudential regime; (5) governance of the macroprudential framework; (6) linkage between monetary and macroprudential policy; (7) how far the current macroprudential regime is from FSB/G20 recommendations; and (8) how quickly policymakers respond to the need to implement FSB/G20 measures intended to ensure ﬁnancial system stability. Detailed discussions of the categories are provided in Lombardi and Siklos (2016a). 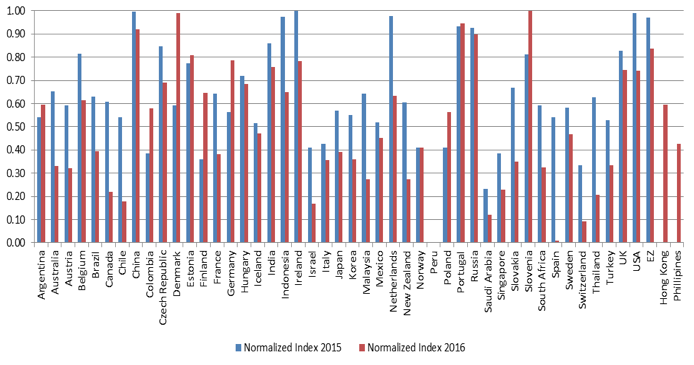 The presented indexes are normalised between 0 and 1, as doing so allows for easier comparisons across the economies examined (also, see Lombardi and Siklos 2016a, Figure 1). The only clear exception is Spain because it has no well-developed national macroprudential policy framework. However, Spain largely depends on the EU where such a framework does exist. Of course, anecdotal and some financial data suggest, for example, that China and Russia are at substantial risk of continued increases in nonperforming loans and expansion of shadow banking activities, putting them at substantial risk of future financial system crises (e.g. IMF 2016). As previously noted our indicator is a mix of de jure and de facto characteristics. This variant of the index only includes the 25 economies for which the FSB provides progress reports on shadow banking reforms. See here. Prior to the Global Crisis, there was a growing separation of borrowers and lenders in the securitisation chain. Under the ‘originate-and-distribute’ principle, lenders did not bear the credit risk when a borrower defaulted. Hence, a deterioration in the quality of credit of the underlying assets emerged. Rather, credit risk was shifted to investors. Other institutions are also involved such as IOSCO (International Organization of Securities Commissions), the International Association of Deposit Insurers (IADI), and the IMF, to name just three.